Good. NO DUST JACKET. 1971 EDITION. Sold by the UK charity Langdon: Supporting men & women with disabilities. Dispatched within 1 working day. Very Good. Here is the first, fully illustrated, English language edition of this masterwork, with abridged text approved by Shirer and over 450 rare photographs, drawings, and maps in color and b&w. Sewn binding. Paper over boards. 256 p. History of Nazi Germany. Very Good. 0671624202 Ships promptly from Texas. Fair. Size: 17 to 19 cm tall (12mo); 1436 pages. 1st class post to the UK, Airmail worldwide. Robust packaging. I have read Shirer's book before, but copies I owned previously were lost over the years with moves. This was an inexpensive copy of an early printing of the first edition, in very good shape although without the dust jacket. I'm happy to have it back in my library. It is unusual to find a book which, whilst universally viewed as an important historical resource, is difficult to lay aside once begun. William Shirer's magnum opus fits the bill on both counts. I first encountered "The Rise and Fall..." through a textual reference in a book by Robert Fisk and have been ever thankful that I followed up. Within this book, the historical background to events is well explained, and the personalities of those involved are properly explored and vividly presented. 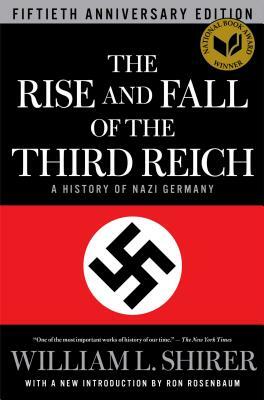 The author, it should be noted, was present in Berlin throughout the rise of the National Soclialist Party, working as a journalist; following the collapse of the Third Reich, he had the first civilian access to (literally) tonnes of paperwork left behind by the Reich's perpetrators. Such is the stuff of dreams for historians, and Mr Shirer made good use of his extraordinarily good fortune. The resulting book, whilst neither glib nor lightweight, is enjoyable and fluent, the writing style narrative and engaging. This is, hands down, the finest history I have yet encountered of what must be the pivotal series of events of the 20th century. I would not so much recommend this book as exhort you to read it. Neither judgmental nor forgiving, its continual subtext is, as Jorge Santayana famously opined, that those who forget history are condemned to relive it. This book goes some way to maintaining memory, and for that may we all be thankful. Mr. Shirer knows his stuff and anyone interested in history and World War II should read this book. The two world wars endured during the 20th century were complex and deadly and to paraphrase a quote, those who don't know their history are doomed to repeat it. We have teetered on the verge of WW III several times over the last 60 years. Kennedy's stand-off with Krushchiev was the closest. Our existence is precarious enough without the element of war. To understand what and why happened in the 1940's and the attitudes of the main players is important to understand so that we may recognize the pattern that leads to such conflict. Read and learn. One of the most detailed and accurate versions of the Nazi mission.